Spain’s youth unemployment rate currently sits around 37%, meaning that more than one third of people under 25 are without a job. “We are suffering but people don’t see it” says Susana Deschamps before taking a deep breath. She punches her palm as she talks, and looks up at the ceiling shaking her head as she explains how difficult it is to get a job in the country she has lived in her whole life. It is especially difficult in Andalusia, Spain’s southern region, where Susana and her friend Carolina Abuawab from Bolivia are finishing their high school degree. Susana and Carolina, despite only just finishing high school, are feeling disheartened about their potential future in the country they know and love. Cádiz’s old city stretches out onto the southern coast of Andalusia, a region of Spain with cultural abundance. Beautiful beaches line the café-filled, narrow streets, and the architecture is a fine example of Andalusia’s rich past. The border between the old city and the new city, which is marked by an alluring sandstone archway, separates tourist Cádiz and real Cádiz. Real Cádiz, as Carolina and Susana explain, is much poorer than what visitors tend to think. “A lot of people come to Cádiz for vacation because they think Cádiz is the Miami of Spain. 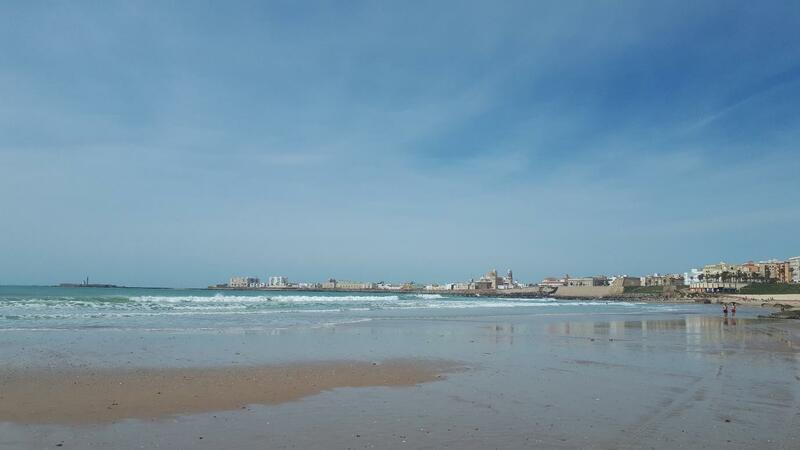 But if you live here, you realise how life really is, and it’s the forgotten part of southern Spain,” explains Carolina, who fell in love with Cádiz once moving here. Susana and Carolina explain that when they finish their degrees, they don’t feel optimistic about getting a job. She talks about one friend in particular who has two degrees, one in law and one in administration, but despite having top grades in both, cannot get a job. Employers want to hire young people with experience. “It’s funny because they want young people, as we are the face of the new world, but they want experience too. But I cannot have experience if you do not give me work!” exclaims Susana. “My father was unemployed for seven or so years. I remember being told when I was young that a lot of people in Spain are unemployed, and I thought ‘yeah, my father is too! It is not so uncommon after all’. OECD explains that youth unemployment rose in Andalusia after the financial crisis, when the region was hit harder than most other regions in Spain. This is because its economic structure was heavily dependent on construction and tourism and had fallen behind in industrial diversification. This revealed the flaws in the regional labour market including low level of skills due to education. The government of Spain and the autonomous government of Andalusia need to improve the overall education attainment levels according to the OECD, as well as improve the relevance of tertiary education, and to improve the flexibility of the workforce as well as diversify the existing industry itself. But the government of Spain is a mess, the girls explain. There is a lot of money poured into some areas, and sucked out of others. This means that there is an imbalance in the economy of Spain, driving the unemployment levels. Not only does it affect the youth, but 16.7% of Spain’s entire population is unemployed, which is more than double of the EU average. These unemployment levels are not down to the quality of education, the girls explain. “There are really good universities here, and education is free,” explains Carolina. Seemingly, it is possible to gain a high level of education in Andalusia, and living costs are cheap. But if you can’t get a job, which is likely, you have to move to the major cities where the living costs are not the same. “Cádiz Is close to Málaga and Seville. These two cities are the wealthier cities of Andalusia.” says Susana. However, Susana promises: “We are always happy, the people in Andalusia! We are in our worst times talking about money and jobs, but on the whole, we are happy!”. “But, I am going to spend my life working in McDonalds if I don’t leave.” she adds.